Starting a blog is just the beginning. Publishing a blog post? Yes it is just a beginning too. You need to realize that it is not enough to build something useful and attractive. You need to let the world know that your awesome blog exists! So how do you do that? That department is called “marketing”. I know, the very word could turn off many small business bloggers. Blog marketing could sound like too much of a technical word and many small business bloggers don’t even want to hear about it. I used to be like that too. But marketing doesn’t have to be as complicated as you might think of. Of course, there are advanced marketing techniques that you need to learn, and master some day. And, there are certain marketing techniques that would demand you to invest a lot of time and money to it. In this post I am not going to talk about those marketing techniques. 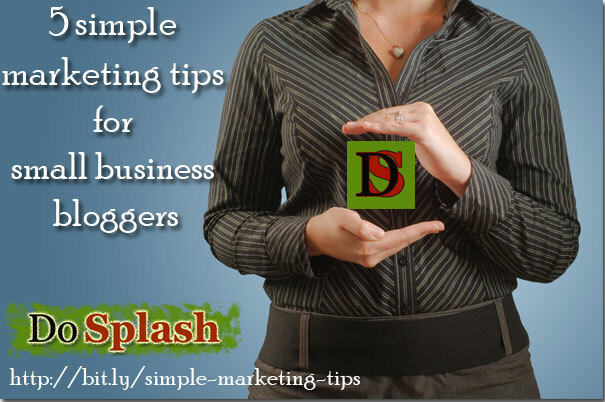 I am going to share “simple” marketing tips for small business bloggers. The marketing tips that I’m going to share in this post are simple ones, aimed to be useful to beginner bloggers. And, yes of course, both beginner and advanced bloggers can make use of these “simple” marketing tips. You can apply these tips right away to your business and enjoy the benefits. Blogging communities are a great place to promote your content. But wait, don’t run away to join blogging communities and litter them with links to your blog posts. It doesn’t work like that. A blogging community is a great place to make connections. It is a place where like-minded fellows gather. So it is a place where you can “find” people to connect to. Now, as I said, creating accounts on these communities and simply submitting your links won’t cut it. Engagement is the key here. I’ve already written a post on how to make the most out of blogging communities, so I won’t repeat it in this post. You can read the post here. Social media mostly turns out to be a distraction in many cases and we cannot deny that fact. It is because social media is a place to chill, and hang out. But it can be used for business too. That is both a plus and a minus of social media. The minus is that since it is a place to chill, there is a greater chance that you get sidetracked a lot even if you went there to do business. The infinite scroll of Facebook and the cute cat videos on Youtube could kill your time before you know it. Many bloggers stay away from social media because of this fact! But it is not wise to neglect social media. Why? The number one reason is because your audience are hanging out on social media, so you should be present there too. Now, you don’t have to overwhelm yourself by trying to be present everywhere. You should try out all possible social media platforms (that would suit your business) and then stick to 2 or 3 platforms that work best for you. This way you can strategically do your work on social media and reap the results. The second reason is that your audience, while they’re on social media platform, will be in a much cooler mood. Even if they are not cool, it is an informal place. If they see you and your business on social media they will be more likely to check you out casually rather than in a formal platform. I know what you are thinking. Blog commenting is dead! That’s what you’re thinking, right? Well yes and no. Blog commenting for links and spammy blog commenting is dead. But blog commenting to build connections, to build authority, to build brand awareness, and to build traffic is alive and it will be! I can say this from experience. I’ve gained a lot of benefits and have become known in the blogosphere because of my commenting activity and guest blogging (more on this below). Now, when I say “blog commenting” I hope you automatically understand that it is not about leaving “great post” kind of comments. Make sure you seek out to blogs in your industry (although this isn’t a necessity) and blogs that have a decent amount of activity. If no one else is commenting on that blog except you, you won’t get much benefits for your efforts. And you have to make sure you read the post fully in order to leave a thoughtful/useful comment – skimming is not enough. After reading the post, if you don’t feel like saying anything, don’t comment. Don’t force yourself to leave a comment since this will affect the quality of the comment you leave. By following some basic principles and some common sense, you could really rock with blog commenting. Again, this has become a controversial topic. Guest blogging was misused by many marketers to an extent that Google had to penalize many sites on a bulk basis. Since then the spammy guest blogging is dead. That’s what Google aimed to kill anyway, even though some of the genuine sites got hit too! Nevertheless there is no reason to believe that genuine guest blogging is dead. It isn’t and it won’t be. This is a very important marketing tip! No matter how advanced marketing tactics you use it is important to log the information. Did you try out a new marketing strategy? Did you recently do a lot of guest posts? Do you see a spike in traffic? Do you know what marketing effort of yours brought that traffic in? Do you see an improvement in rankings? Can you relate that to any of your marketing efforts? You should be able to track your progress and closely monitor the results you are getting with your efforts. If you don’t track or if you don’t pay close attention you won’t be able to know what works and what doesn’t. And this is crucial. If you do not know what works and what doesn’t work with your business you won’t be able to improvise on your strategies. Ideally you should start applying a marketing strategy (do it consistently for the reasonable amount of time) and watch for the results. If the strategy pays, you should be doing more of it. If the strategy just doesn’t get you the results, you should stop wasting time, money and efforts on it and move on to try a better strategy. This will be possible only if you pay attention to what works! Are you ready to implement these simple marketing tips as a beginner blogger (or as an advanced blogger, too!)? There is no reason for you to not to do this! As I’ve said, these are really “simple” marketing tips. I don’t say these are easy. Of course these marketing strategies involve hard work on your part and you have to indulge in them consistently in order to reap benefits. But these are not rocket science. They don’t need any expert level of skills (besides the ones you already have to run your own blog). And you don’t have to spend a huge amount of money on implementing these marketing tips. Try these out and let me know how it goes. Before you leave, please be kind enough to share this post to your social circle. And, let us know which of these 5 marketing tips you like the most? have listed.. Will check them out for sure. Sometimes keeping it simple is good. For me, the simplest, most powerful thing that has been bringing me traffic is blog commenting. Before the onset of the traffic, I use to blog 5 to 6 days a week thinking the traffic was just going to come. Not in this lifetime! Blogging is great, but if no one knows about it, then it becomes a waste of time. You’re just blogging for yourself. So yes, you brought up some really simple, but powerful ways to market your blog. I will have to check out some of the blog communities you mentioned. So far I’m using Kingged.com and Blokube. I really enjoy Kingged because I find the same people that comment on my blog, I see them in my facebook groups, and I like how the site is organized into different categories and niches. A blogging friend of mine told me about DoSplash and I plan on checking it out this weekend! Thanks for the helpful tips! I hope you have a great weekend! very useful article for any small business owners who need to market their content. but without being a spammer. As you mentioned, the key is to engage and interact with people. In fact, it’s called “social”, right? Thanks for adding “Klinkk” to your list of blogging communities recommended. I like to be a part of these , because I can receive not only traffic, but also new connections (which is the most important benefit, in my opinion). Jane, This is very helpful and succinct. I will try to get more active in this community and join some of the other ones you mentioned. Creating relationships is so important. Yes i do according to this tips from these post right now as am speaking in the last 24hours am seeing a good number of traffic into my blog. Thank you for sharing your tips. I couldn’t agree with you more about comment marketing. This is one of my main lead generation tools and I’ve acquired a couple of clients through this method. I have to say though that there’s a trick on how to effectively use comment marketing to increase the chances of them clickingh you link. This trick has dramatically increased the clicks I’ve been receiving after I implemented it. Article that I recently published about “The A – Z Guide to Guest Posting That Will Help You Grow Your Blog”. I’ve added screenshots and the tips I shared are very actionable. To those who wants to learn how to guest post, I’m confident that this will give them the value that theu are looking for.